Email marketing gives you a way to reach targeted audiences in an affordable way that increases awareness of your brand and increases sales. Additionally, email messages are easy to share, so you can dramatically expand your reach if you take a sensible approach. Of course, spam filters and crowded inboxes present considerable challenges to you as a marketer as you try to connect with your audience before they delete your messages. In other words, successful email marketers must overcome some basic challenges before they can begin to get results. Many businesses make serious mistakes that prevent them from connecting on a personal level with their recipients and often waste their time and money pursuing ineffective strategies. Although a seemingly limitless number of pitfalls exist that can derail your email marketing effort, some mistakes have more harmful repercussions than do others. The following article discusses five serious email marketing mistakes and how you can avoid them. Mobile users continue to dominate the Internet. By sending emails that most of your readers can’t read, not only are you wasting their time, you are also creating an aura of incompetence and damaging your brand. For starters, you must create text, graphics and video content that your recipients can easily view on smartphones and tablets. Additionally, you must ensure that other elements such as buttons and scroll bars are easy to see and tap without producing an undesirable result. In this case, creating designs with sufficient white space surrounding controls can do a lot to improve usability. For the most part, you should give your readers a pleasant experience that allows them to assimilate your message without having to squint, pinch or zoom. If you fail to provide easy access to your information and call to action, your readers will lose patience and you will lose a chance to close a sale. Taking shortcuts with your email marketing can waste your time and money while giving your brand a bad reputation. This consistently happens to companies that make the mistake of buying or renting email lists rather than building their own. When you make the effort to build an email list based on people who have visited your website and voluntarily enrolled, you create a well-qualified audience of prospective customers. As a result, you can expect to enjoy high open and click-through rates because your recipients have already expressed an interest in your brand. Consequently, you can also anticipate an above-average return on your investment. Each person on your list has individual needs and circumstances. Although creating a special message for each recipient would require a lot of work, you can achieve similar benefits by segmenting your list. By grouping your users according to their particular demographics, buying choices, and other criteria, you can increase the relevance of your email marketing without substantially increasing the amount of time you spend on each campaign. Although breaking your list into groups might seem like hard work, the job becomes incredibly easy when you have access to the right software. With the right solution, you can craft and test multiple versions of the same email and then intelligently divide your recipients using meaningful criteria. Results of creating targeted messages for the various segments of your list include higher open and conversion rates. Also, you can expect to have lower unsubscribe rates than you might experience with an unsegmented list. As you monitor the analytics data from your campaigns, you can optimize your segmentation to get even better results in the future. As has been noted, segmenting your email marketing list gives you a chance to increase the relevance and results of your email campaigns. In addition to segmentation, you should understand the power of personalization. For starters, use an email marketing tool that allows you to address every reader by name. Alone, such a simple measure can make a big difference. People love feeling a personal connection between them and the brands, products and services they buy. With this in mind, use the information you have available, including that which comes from your CRM, to personalize your email content. Of course, you need to make sure you have a good application available that will integrate with your business software, manage your campaigns and monitor your results. Sure, you want to make a sale. Doesn’t everyone? Still, you need to exercise caution while crafting your marketing emails because overly promotional emails tend to turn people off. Rather than creating email messages that focus on your products and services, acknowledge the challenges and desires of your audience. When you demonstrate the value that you can deliver, your customers will feel more inclined to do business with you. To help you avoid the constant drumbeat of sales pitches, take a long-term view of your email marketing strategy. By taking a gentle approach, you prepare your audience for future sales without pressuring them to buy. Otherwise, they will most likely unsubscribe from your list just to avoid your high-pressure tactics. 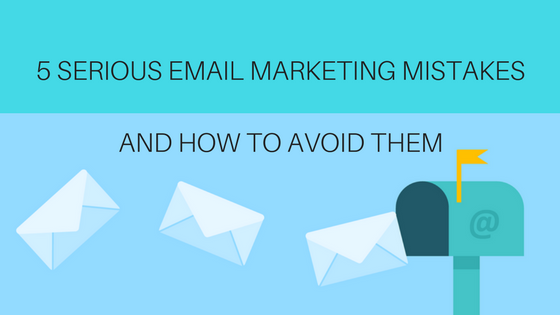 In conclusion, you can avoid these five serious email marketing mistakes by taking a well-planned practical approach to email marketing. By appealing to mobile users and building your own list, you lay a solid foundation for your efforts. In addition, by segmenting your audience and adding value before asking for a sale, you develop trust and set the stage for long-term growth. Author bio: Ashley Wilson is a freelance writer interested in business, marketing, and tech topics. She has been known to reference Harry Potter quotes in casual conversation and enjoys baking homemade treats for her husband and their two felines, Lady and Gaga. You can reach Ashley on Twitter @ashleygwilson.